How to do a Simple Shri Krishna Puja? The greatest Shri Krishna pooja that a person can do is to read the Bhagavad Gita and contemplate. But many people feel the need to perform a puja when they feel they need to connect with the Supreme Being. A simple puja dedicated to Lord Krishna helps in keeping the mind calm and in concentrating. Some people exclusively perform Sri Krishna pooja during Shri Krishna Jayanti or Janmashtami or Gokulashtami. Here is how to perform a simple puja dedicated to Lord Krishna. Select a calm and quite place. Clean the place and then take a bath. Place a photograph or idol or picture of Lord Krishna also of Lord Ganesha. Keep a lamp ready. Place some flowers and fruits or sweets ready in a plate. Meditate for a few minutes to clear the mind of unwanted thoughts. Meditate or pray to Lord Krishna. Offer flowers – Tulsi leaves is the best offering made to Krishna. You can light incense or agarbathis. If needed you can ring the bell, while offering flowers. 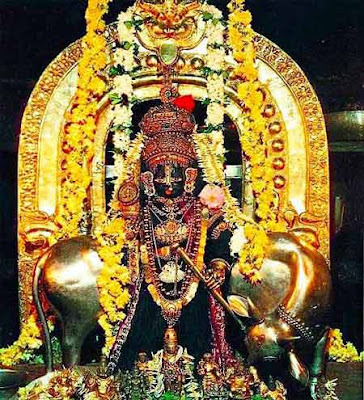 Chant the shloka – Om Namo Vasudevaya Namah. Now offer fruits or any sweet or usual food prepared for the deity. You can sprinkle some water after making the offering. You can meditate for a few minutes or read some shlokas or prayers dedicated to Krishna. After the Krishna Puja remove the fruits and share it as ‘prasad’ with others. After the puja, find some time to read the Bhagavad Gita and contemplate. You will find ideas and thoughts rushing in, which will help you in finding new meaning and direction in your life. Other spiritual books that can be read include Uddhava Gita and Srimad Bhagavad Purana. Shri Krishna taught us to rise above rituals and to perform action. The best offering to Shri Krishna is to perform one’s duty by realizing the Brahman within.